Zero Carb Interview: Matt Shepherd | Eat Meat. Drink Water. This entry was posted in Interviews and tagged Diet, Fat, Health, High Fat, Keto, Keto-Adapted, Ketogenic Diet, Ketosis, LCHF, Low Carb, Meat, Nutritional Ketosis, Owsley Stanley, Paleo, Paleolithic, Primal, Weight Loss, Zero Carb by esmeelafleur. Bookmark the permalink. WOW, I have been Low Carb for over a year now. Ketogenic diet was for me the cure for celiacs, lactose intolerance and histamine intolerance. I did most recently consume carbs and gained +-15kg waterweight overnight. I also went pre diabetic and hypoglycemic (just because of 1 day carb consumption) my whole face was swollen, hands swollen and i had severe temper and concentration issues. It appears to me that I´m by default sucrose/glucose/carb intolerant. What bodyfat percentage (+- by estimation) do you and other Zero Carbers usually hold and how do High Intensity workouts work for you and how well do you perform in terms of reflexes and under extreme stress? I’m sorry, but I do not know my body fat percentage. I would say that it is relatively low because I have very good muscle definition and I do not do any strenuous exercise. Before going ZC, I weighed 140 lbs. Now I am 123 lbs. I am 5’6″. Before ZC, I did not have good muscle definition. As I mentioned in the interview, I do not do strenuous exercises, so it is not possible for me to comment about high intensity workouts. However, what I can say is that I have found myself in situations that required the maintenance of energy for long periods of time. For example, I used to go on business trips. I would have my first meeting in the morning at 7am and have successive meetings throughout the day all the way to dinner at 8pm. Usually, that meant eight full meetings a day and that included getting from one side of town to the other. I know that having meetings does not sound energy intensive, but it required a lot of brain work on my part and the brain uses about 25% of our energy on a normal day. The topic that I was discussing with clients was complex. As for extreme stress, there is a world of positive difference between the zero carb me and the mixed eater me. Without a doubt, I now handle stressful situations much better now and that includes better reflexes. It’s hard to explain, but I now know that particular stresses are simply part of life and that I should not get overly upset about it. That is the way I would describe it in a sentence, but it does not capture the true meaning of it because I’m merely verbalizing an inner feeling. I am better able to assess stressful situations, which means that I can be more objective about it and take better action to remedy whatever it may be. Or, if it is out of my control, I am better able to deal with the consequences. I realize that I did not directly answer your questions, but I tried to give you a sense of what zero carb feels like for me. I remember about five or six months into being zero carb when I had an epiphany. I remember thinking to myself: “wow, so this is what it feels like to be a real human being!” That was quite a moment. It partly had to do with the sense of well-being that came with my improved physical prowess and mental abilities. There is a reason why humans are the world’s most successful predators. We have an extreme intellect that is matched with an agile body. thank you very much! A very thorough response! I`m getting an Idea. I intend to do the transition phase very relaxed with little and light workouts only. I will definetly report on High Intensity performance, when I`m a few months in and fully adapted. In my understanding by eating fat first and reducing protein intake, one increases ketone levels and looses bodyfat easily and I will use this approach to maintain a lean physique. I`m ver excitet 🙂 ! Also I forgot to mention previously, I only eat once a day (late afternoon) which I started as a diet but I`m sticking to it out of convenience and time saving. A great comprehensive, cogent and concise interview. Thanks “Matt Shepherd” and Esmee. I would answer all those questions exactly the same except that I eat only pork and drink only water . I still find it annoying that my friends and family are trying to convince me that I am crazy for eating the way I eat but I care less and less about any of their opinions on the matter . Acer…..those are my sentiments exactly. After 6 1/2 years of eating this way, I’ve come to the point of not caring a bit about what other people think because I know that what I am doing is right. The uninformed opinions of others are meaningless. I’d be interested to know how you do your aging meat set-up in your refrigerator. I’d be interested to know where to find a piece of meat like the one on photo 🙂 . I never saw anything like that fresh ,only smoked . That is rib roast, or bulk piece of ribeye. I’ve been buying 15 to 20 lbs slabs of ribeyes for years from either Costco or BJ’s. They generally have the best prices. Also, the cost per pound is lower than the same meat cut into steaks plus you get the added bonus of getting all the fat. 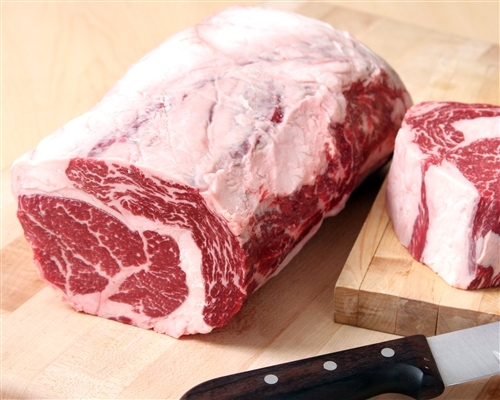 I personally do not like individually-cut steaks at the store because the butcher trims too much of the fat. I should have mentioned above that dry-aging works best with ribeye sub-primals, but you could also do top loin (i.e., New York Strip). The dry-aging process is simple. First, you need what is called a sub-primal piece of meat, which is a 15 to 20 lb slab of beef. (Steaks are created by slicing the sub-primal.) Place paper towels on the lowest shelf of the fridge. Put the sub-primal on a metal (stainless steel) rack, such as the ones that are used for cooling cookies after they are baked. Leave it in the fridge untouched and uncovered for at least 2 weeks. That is really all there is to it. It is important that you should minimize the chances for cross-contamination, so do not at the same time have uncovered fish or chicken in the fridge. Also, it helps to have a constant airflow over the slab, so I use a USB fan inside the fridge. You can plug the fan in an outlet outside the fridge. The wire to the USB fan is thin enough not to interfere with the seal on the fridge door. I would post a picture of my set-up, but I do not see an option nearby for doing so. I know that this is not the forum for a political conversation but I am very interested in how your understanding of politics and economics has changed. Can you give me a general idea of that direction? Because I learned first hand that eating fatty meat is not the killer that the conventional indoctrination foists on us, I also learned to question other widely-held assumptions held by me and most people. In politics, one over-riding narrative that is widely accepted is that the U.S. is a properly functioning democracy. The majority rules. The majority elects politicians, who in turn have a nearly free hand to do whatever they want. For example, if the majority votes for a politician who promises free health care and higher taxes, then we will surely get both despite the rights, opinions, or desires of voters who are in opposition. I began to question that assumption. Why should the majority rule over the minority? Isn’t that a brutal and immoral way to live? As an example, if the majority votes to ban the production of meat, why should the minority of people who did not vote that way suffer? Why do we assume that Democracy is the proper system? It seems evil to me if it means the biggest gang can trample on the rights of others. It became very clear to me after going ZC that each individual has a right to live his life as he alone chooses, provided, of course, that he does not trample on the rights of others. In politics, the key is not how we elect our political leaders, but the range of action permitted to the government. There are things that should be off limits to the government and not subject to the whim of voters. In economics, I began to question the assumption that the government can create prosperity by taxing and spending other people’s money. The fact is that wealth is only created by people who produce something of value. The government provides a valuable service by keeping law and order, but it does not create new wealth. After becoming ZC, I thought of what the government currently does in this way: if a criminal robs someone and then spends all the loot, does that spending help the economy? After all, in essence, that is what the government does when it taxes (or borrows) and spends. The criminal may have more money to spend, but the victim has less. Why do we all assume that the government can boost the economy when it produces nothing of value that it has not first taken from taxpayers? Why do we assume that a centralized planning committee (e.g., the Federal Reserve) knows how to manipulate the economy? I now know that none of the widely-held assumptions about the economy are true. At the same time, I think that government is absolutely necessary because we each need protection from criminals and foreign invaders. I am not anti-government, but I am anti-rights-violating-government, which is what we have now. It is sad. Thanks, Tante. I glad to see that you are in agreement. I only hope that more people wake up and understand that each person has a right to live his life as he chooses regardless of what others may think or may vote. And there are plenty of Americans that would love to dictate your dietary habits. Thanks Matt. I appreciate the response.